Is a split possible on this? Topic: Is a split possible on this? I have a Sho~Bud Pro-I vintage steel and I am wondering if a “split” tuning is possible on this guitar, or if there is a way to modify it to make it so. The guitar is a single raise / single lower changer, 2-hole bellcranks w/tunning barrels. Vintage around 1973. I have recently installed a couple of new knee levers and one of these lowers my B’s to Bb. My standard Emmons A pedal raises the B’s to C#. When I engage both the A pedal and the new lever, I’d like to get a properly intonated C note, but it’s tens of cents off. Is it possible to do anything with this instrument to get an in-tune note will simultaneously raising and lowering a string? What I want is a Drop half-step + Raise full-step = Raise half-step. I think I’m using the term “split” correctly, but I’m not even sure about that. Any thoughts? Mark, I'm not really a mechanical genius, but seems to be it would be nigh on impossible without another hole in the B string changer finger. That's how you achieve splits on a guitar without screws. That feature is now a must in any future guitars I buy! Thanks John. I bought this guitar new in ‘74, and plan to hang on to it for as long as I’m able to sit up and take nourishment. I’m therefore not afraid of making any “reasonable” modifications to the guitar since I don’t intend to re-sell it. Adding screws would be probably OK, but I don’t have a clue as how/where/why this is done. Just wondering if anybody out there ever come across a solution for this on this type of guitar short of a Full Frankenstein mod. Yes easy to do. You will need another brass roller on the puller that lowers the 5th string. Then after you put that on; you will now run the Raise rod through that new roller(it's it the raise position on puller) and a barrel behind it also but tighten the barrel to the rod at the very far throw of the crossbar that lowers the 5th. So now tune your open B. Now push A pedal and tune 5th string C#. Then the same for C pedal. Now push the A pedal down for C# note and hold it while you lower the Lever to C and tune the Lower rod for that C note and if not enough to get there; back out stop screw till does. Ok NOW YOU READY? ?ha...lower just the lever from B to Bb and it should actually lower a little too far...so allen wrench in Raise Rod and tune that extra split tune barrel back up to Bb. Now go back and retune all the raises A and C pedal again ...cause they might move when tuning that split barrel...but now re-tuning those pedal barrels won't even touch the tuning of the split barrel cause its too far from puller......yeeehaaa...now you have intune Open B...and pedaled C# and Lowered to C and lowered to Bb...yeeehaa...and I guess you can do that to the 10 string. John, the genius of the single-single changer is that a large number of barrels can share the rod. That's why my MonsterBud is built on that changer. As Ricky pointed out, all he needs is a barrel and a puller to put on the raise rod at the lever's bellcrank. Many thanks Ricky! That's a fair bit to digest, but I think I follow you. I did run into an issue though. The 5th string raise rod will now have 3 barrels on it; A pedal, B pedal, and the B to Bb drop knee lever. Here's a picture of the knee lever bellcrank ready for the new brass roller to be added, so there will then be TWO rollers on this bellcrank. 5th string raise rod shown withdrawn, ready for new brass roller. 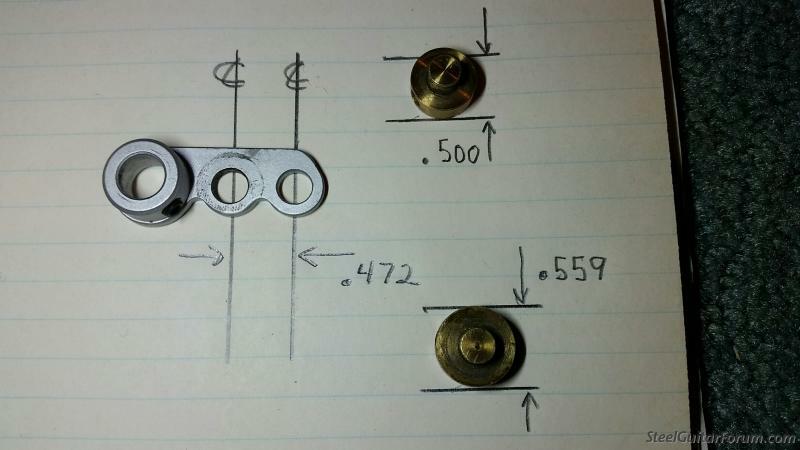 The problem I encountered when trying to do this is that the brass rollers are too large to coexist, two on a crank. There are two rollers here. The large one (.559) is an original part, and the 1/2" one is aftermarket from Micheal at PSG Parts. Even if I use the smaller parts, there is an interference issue. I can certainly get around this by grinding a couple of flats on the rollers, parallel to the through-holes, but before I take that step, I want to be sure I understand. I want two rollers on one bellcrank. Is this correct? Why would there be a barrel on the B pedal, 5th string? Or did you misspell C pedal? Yes, you need 2 rollers on the B to Bb bellcrank. 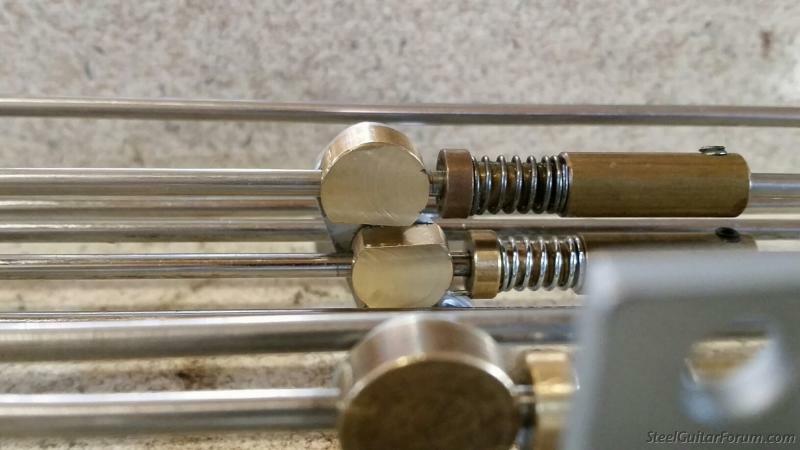 You could possibly put the lowering roller on the 'wrong' side of the bellcrank, there might be enough 'looseness' in the system to allow that. Yes Lane. You’re right. That was a typo regarding the B pedal. Standard Emmons setup with A & C pedals, and now the knee that lowers B to Bb. Richard. 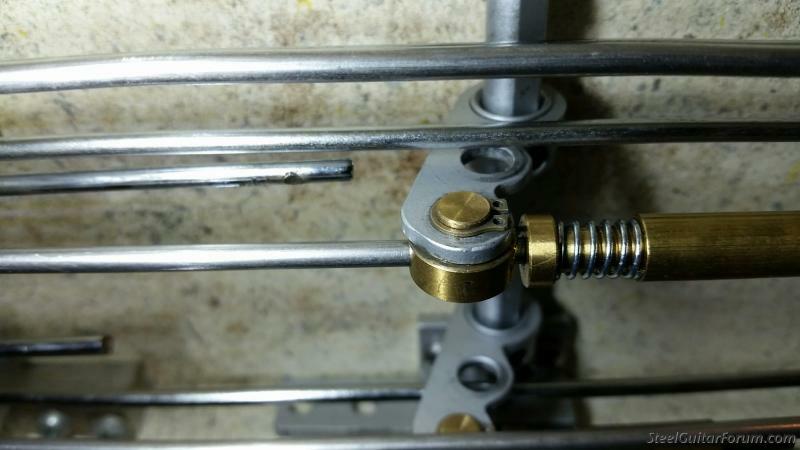 I considered your idea about mounting the rollers on opposing sides of the bellcrank, but that would cause the 5th string lower to enter the changer at a slightly oblique angle. This is somewhat exaggerated as well as the lever is pretty close to the changer. I have had binding problems in the changer on a seperate occasion when I tried this with a modified bellcrank to mitigate pull timing. That changer seems to really like a straight pull and release or it can get hung and not return to neutral. Good thought though! just grind the roller a little flat on one side....so it will go on underneath the roller that lowers the 5th string. FANTASTIC! And what an elegant approach to the problem too! Really nice that I didn't need to make any major modifications to the steel that involve drilling/tapping/hammering/cursing. I only needed to mill a couple of flats on the rollers and that addressed the interference problem. The only lasting concern I have is Loosing the recipe (sequence) on how to tune it. I got there OK, but somewhat by hit and miss. I need a methodical, repeatable approach to tweaking without getting it all buggered up and lost in the process. Ricky. Thanks a million! This is a very clever and elegant solution. Awesome yes I've been doing half moon to those rollers for many many years, because they do have to roll a little bit on the engagement of the crossbar. Still, I think this is a really cleaver method! Plus, I now have a new appriciation for the single/single rod and barrel changer scheme. Thx again Ricky.